This might sound odd, but we fell into this renovation by accident. We aren’t property developers, or even great DIYers for that matter. There also isn’t a shortage of property where we live. However, we couldn’t find the right sort of property in the right sort of area. There were lots of properties in our price range and, but they were either too big, too small, or in the wrong location. We were particularly attracted to period properties, but while they have lots of character, they just were designed with a different way of living in mind – while we could imagine renovating such a property, what would you do once it was finished? It would be expensive to heat and light and probably wouldn’t have been a good fit for the way we live. It seemed that the combination of a period property with modern open plan living was just too hard to find. We then came across a property – 2 cottages and a barn – in the right location that needed to be renovated. It didn’t go onto the open market and we knew we had to be quick if we wanted to buy it. We were lucky. The sale went through very quickly. And in July 2012, we found ourselves with a renovation project on our hands. When we started the renovation, the estimated “move in” date was March 2014. It seemed a long way away at the time. However, we eventually moved in on 25th March 2014. While we might not have been exactly on the budget, we did move in on time! With these sorts of projects, there seems to be a massive amount of information and decisions that need to be made. 6 months in and the paperwork started to mount up. It all needed to be collated into one place and easily searched – particularly since information doesn’t necessarily present itself at the right time. I wanted to make sure that if we came across great ideas that we could find them again later when the time was right. So this site has ended up as a mishmash of ideas, facts, and updates. We have often used it for our own reference – providing links to others on particular topics. Often I had even forgotten that we had blogged on something and ended up searching the entries here to find the information. But there was another reasoning for keeping a blog – we wanted to keep a record of our progress over the weeks and months. Even now that we have moved in, the progress hasn’t stopped and I reckon there will be odd projects going on through to the end of 2014 (maybe beyond). Bizarrely, looking back at the entries, some things seem to progress very slowly, while others flew past really quickly. There are occasions on any big project where you just need a bit of a reminder of how much progress has been made – just in case you get the feeling that things aren’t moving in the right direction! When we bought the property it was organised as two cottages and a barn. It used to be three cottages and a barn originally, but two of them (number 9 and number 10) were knocked together in the mid 1970’s. There were also a number of stone outbuildings and timber sheds. 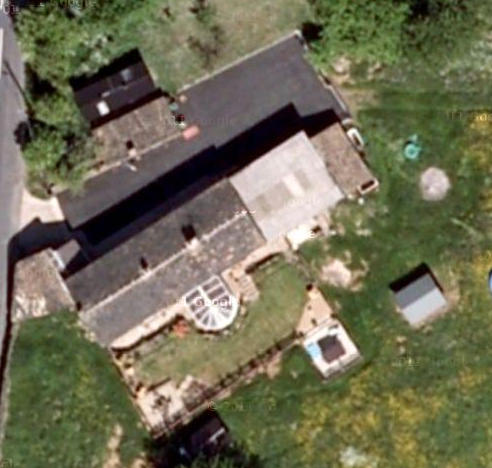 The image below shows the satellite view of the property as it was when we purchased it in the Autumn of 2012. You will find a number of other images on this blog of the property as it was when we purchased it. Satellite image from Google Earth. Not sure when it was taken, but I suspect in 2009 sometime. You can clearly see the conservatory (now removed) and a number of timeber sheds (also removed). We combined the existing two cottages and barn into a single property. In addition, we converted the barn so that it became part of the house. The kitchen, lounge and master bedroom, boot room and utlity room are all in the space that used to be occupied by the barn. The 3D image below provides an illustration of the finished building, however, you will find more 3D images of the outside and inside of the new buildings on the blog. 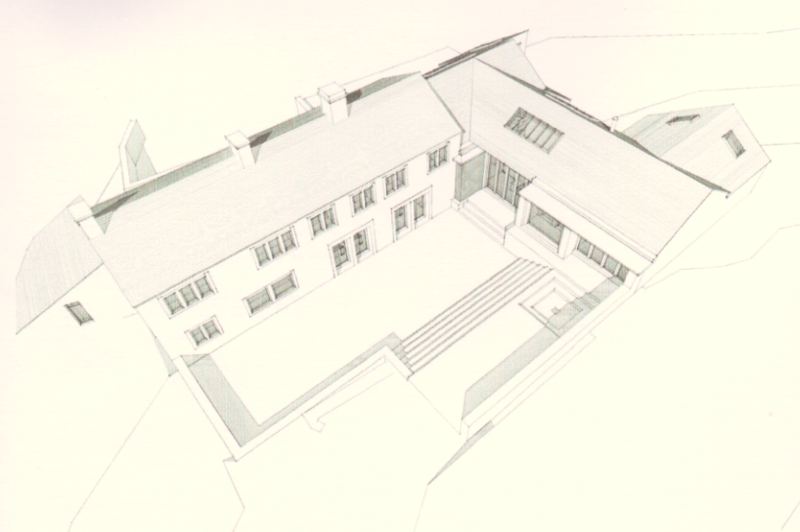 The rest of this blog is dedicated to how this 3D drawing was converted into a house. I hope you enjoy reading through the entries. If there are any questions/queries, please ask. This view is from the back of the building (were the conservatory was) and shows the new extension and courtyard garden. The architects are a local – One17Design – based in Armitage Bridge. very interested in the clear cladding (belzona 5122). where can I get some from? If my memory serves me correctly, this came direct from the supplier based in Harrogate. You can reach them on 01423 567641. It is expensive, but the concentrate does go a long way. Hi S&J, Great blog, many thanks. I wonder if you can provide bit assistance based on your own experience. It concerns installation of new first floor, specifically attaching the wall plate/ledger to existing stone walls prior to new joists. My plan is to remove existing old joists, fill the pockets with concrete and use these to bolt the new wall plate. What kind of bolts, sizes (5m joists), and am I right in reading that you used glue/bolt combi? Finally is it a straightforward layer of dpc between wall and wall plate/ledger or did you add any insulation? We actually moved our first floor up 6 inches to accommodate for the floor insulation that we put in on the ground floor. To be honest, the wall pockets for the existing joists were a bit hit and miss, so I was glad to see these filled in. The new wall plate was bolted to the wall using threaded bar and nuts. I think the threaded bar is either 10mm or 12mm. The threaded bar is attached to the wall by drilling holes and using epoxy anchor glue. There is DPM between the wall and the wall plate to stop any damp penetrating the wall and soaking into the wall plate. We didn’t put any insulation between the wall and the wall plate. We have a pair of oak beams that run parallel to the wall plate. The span from the wall plate to each of the beams is around 2-3m. This would be the sort of thing that I would run by a structural engineer as there are lots of variables here. Hope this helps. Many thanks for your help, much appreciated. All the best. Am loving looking through your blog- just come across it when searching for window paint! We’re doing a much much smaller project, but I really want to get the window colour right- I really like the grey/green you’ve used. If you’re happy to share the colour I’d be really grateful. The paint is Sandolin Superdec in Jungle Green. It has a satin type finish which I thinks works well. The paintwork has been in place now for two years and it still looks great. Let me know if you need anything else. Glad the blog has been useful. congatulations for your renovation. It looks great. I am responsible for the marketing of Spartherm and I am interested in using your fotos from the istallations of the Arte 3RL 100h you have. I hope your are still satisfied with our product. Would it be possible to get the fotos? Its great to read how you took on this project. I am interested in how the Belzona 5122 has performed since you applied it? I have an exposed gable wall in Cornwall which allows a little damp through. It is probably local granite and stone. It continues to work amazingly well. We have had a lot of rain over the past few weeks and you can see the couple of patches where we used the Belzona very clearly. These patches appear to be completely dry – you can even see the areas where some was accidentally splashed onto the top of the stone door jambs. You obviously want to make sure that the pointing is sound before applying, but I wouldn’t hesitate in recommending if you have solid wall with no cavity. It is expensive, but it has worked a treat for us. Hope this helps. – Does it do what you want it to do? – Did you install/configure it yourself (does seem so on your blog)? Was this simple enough? – Any pitfalls, lessons learned and things not to miss out on? Happy to have a conversation, this may be easier. I by no means want to hijack this brilliant blog to plug my buisness but I thought i’d offer some assitance with Loxone, its features, pros, cons etc. I can’t answer for Stephen and Joanna on if it does what they want it to do or any lessons they’ve learned along the way, but I’m more than happy to answer any Loxone or Smart home related questions you may have alongside any project you may be planning or undertaking. Please feel free to contact me via james@emi-automation.co.uk. I’m a Loxone registered partner and always happy to help. Sorry for the slow response. I only recently spotted your comment. I will email you directly with my contact details as it might be easier to cover some of the topics over the phone. Anyway to answer your questions directly…. 1. Yes, the Loxone kit does everything we want it do. In fact, it does a lot more. When I started out, I didn’t quite know where to begin! In the end, I thought if it just controls the lights, then that is an improvement on hardwiring all of the lights and switches (the “old fashioned” way!). As it turns out, we use it for a lot more than that….we use it to open and close our rooflights, we use the PIRs on our alarm system to turn the lights on at night when you walk into the kitchen/hall, we turn the outside lights on at dusk, it controls the extractor fans in the bathrooms, we turn our secondary hot water pump on and off when the burglar alarm is set, we use the presence simulation when we are away etc. And we continue to find new uses for it! 2. I programmed the unit myself. I have an IT background so take the following into account. I don’t believe that it is difficult to program, but the lack of appropriate documentation does make it more difficult than it needs to be. In my personal view, you need to do the programming yourself if you are going to get the most out of the kit as you will want to make changes as you live with the technology. My configuration files indicate that I am on about version 30 as we have made a number of tweaks to the way it works. And we are still tweaking it. We recently added an “All lights off” button for when we go to bed at night and are planning to wallmount an iPad in the kitchen as a dedicated Loxone Controller. 3. In terms of lessons learnt, I would make sure that you label ALL of the wiring (with labels that make sense to you). Our electrician used his own labels and I am still finding the odd loose wire here and there and have to spend time working out where the other end is or what the label meant! There is a lot of flexibility in the system so make sure that you do have some switch wires and capacity in the system. One of the reasons that I went with Loxone was that I wanted to program it myself and not have to rely on getting someone in to do it. So it is worth investing the time it getting to know how it works. While the Loxone “Getting started” documentation is sparse (actually, there isn’t any! ), the videos on the website are good. The technical documentation is pretty good, but not the place to start. Loxone used to have a user forum and that used to be a source of good advice, but that is no longer running (which is a shame). Hope this helps. I will send you my contact details and feel free to email/call me. It seems someone else has revived the Loxone community page, stumbled across it not long ago! Hi, I am looking at putting in a new sandstone patio at the rear of my house, with a retaining wall at the back. I am considering drainage and wondered how the drainage you have put in is working (on both the patio and the pipes on the retaining wall)? I have had various quotations for the work, some saying I need drainage like you have and others saying a French drain (ie gravel) will be sufficient. What are your thoughts? Also, what spot lights did you use on the patio (would you recommend)? Many thanks in advance for your help with this! Hiya, sorry for the slow response on your comment. I have only just spotted it. There are two retaining walls in the patio. The top retaining wall has the top field behind it. The bottom retaining wall has only the upper part of the patio behind it. There is a land drain behind the top wall – you know the sort of thing – a large black corrugated pipe with holes in it. This is at the bottom of the retaining wall and leads into a soakaway in the bottom field. The idea was to stop any build up of water from the top field against this retaining wall. The top field is much higher than the patio so there is a chance the water could seem down the field towards the patio. If the field sloped away from the patio, this would reduce the need for the land drain. There is nothing behind the bottom retaining wall as there is little chance of any water building up here – there is a drain on the upper patio and that underlying material is bedrock. The retaining walls are concrete blocks laid flat and then faced with Yorkshire stone. Any questions, just let me know. Hope this helps. Weather station and webcam stopped working 19 Feb 2016. Interesting blog, especially the technology items. Great conversion. Weirdly, I have got both of them working today. Then I thought I should have a quick look at the comments on the blog and spotted yours. The PC that was uploading the weather station data and webcam images died (it was the same one that we had onsite during the renovation and it was full of dust). Anyway, enough excuses, it is now running again.